In the broad history of our nation’s battle with intoxicated driving, there has been much cause for encouragement. Drunk driving fatalities have declined by a third over the last 30 years, and awareness campaigns have permeated the public consciousness. But while this progress is undoubtedly significant, has the last decade demonstrated as much improvement? Is our country continuing in the right direction, or has success in this area slowed? To answer this vital question, we studied 10 years of fatal car crashes in which alcohol and drugs were a factor. Our analysis employs data from the National Highway Traffic Safety Administration’s FARS database, a nationwide record of deadly auto accidents. By studying statistics from 2007 through 2016 (the latest year available), we discovered which drunk and drugged driving threats remain – and which have emerged over the last decade. To learn how the dangers of impaired driving still loom large on America’s roads, keep reading. In 2015 and 2016, more than 170 fatal crashes each involved drivers under the influence of fentanyl. 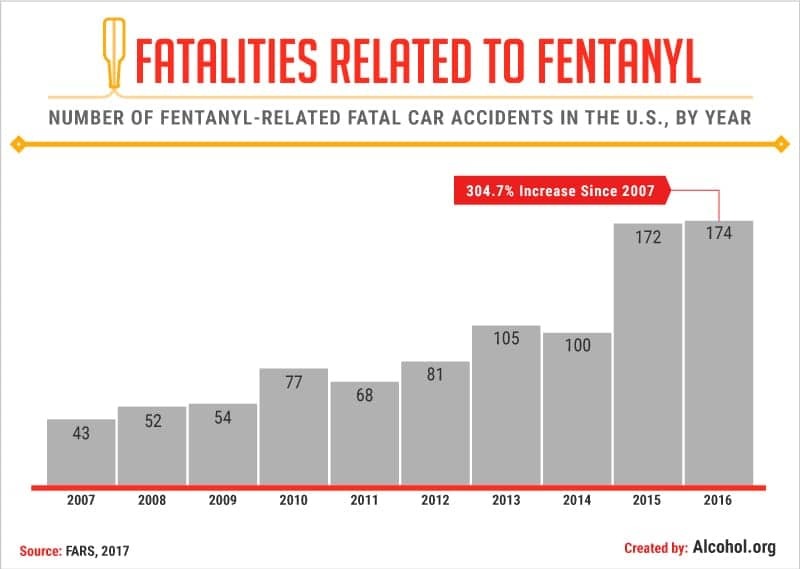 Although public outcry has mostly concerned overdose deaths related to the drug and its analogues ( 20,100 in 2016), our data suggest its dangers extend to the road as well. These findings are particularly striking given how few crashes involved fentanyl just a decade ago. In 2007, less than 50 fatal crashes were linked to this particularly deadly opioid. That total incrementally increased over the following years before a massive jump in 2015. Dramatic incidents have fueled much of the fear inspired by the drug. In 2017, Boston police officers responding to a routine accident were hospitalized after accidentally touching powdered fentanyl hidden in a cigarette box. Given its potency, it’s not hard to see how deadly the substance could prove when used by drivers. Although it may still contribute to many fatal crashes, cocaine’s influence on the road seems to have declined substantially over the last 10 years. 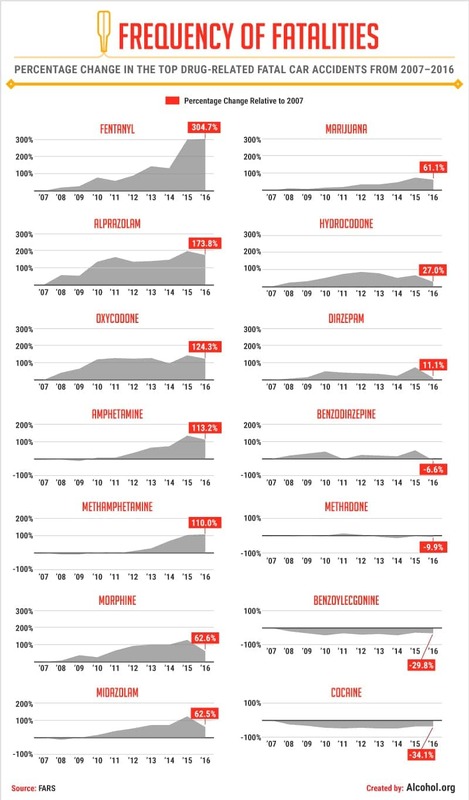 While crashes caused by amphetamines and methamphetamines also saw small dips in the 2000s, they increased overall between 2007 and 2016. The largest percentage increases, however, occurred with depressants. Accidents caused by alprazolam, or Xanax, were 173 percent higher in 2016 than in 2007. Perhaps the most striking surge, however, came with crashes caused by opioids. Accidents involving oxycodone were up 124.3 percent in 2016 relative to 2007 totals. Fentanyl’s spike was even more dramatic, with a 304 percent increase over that period. 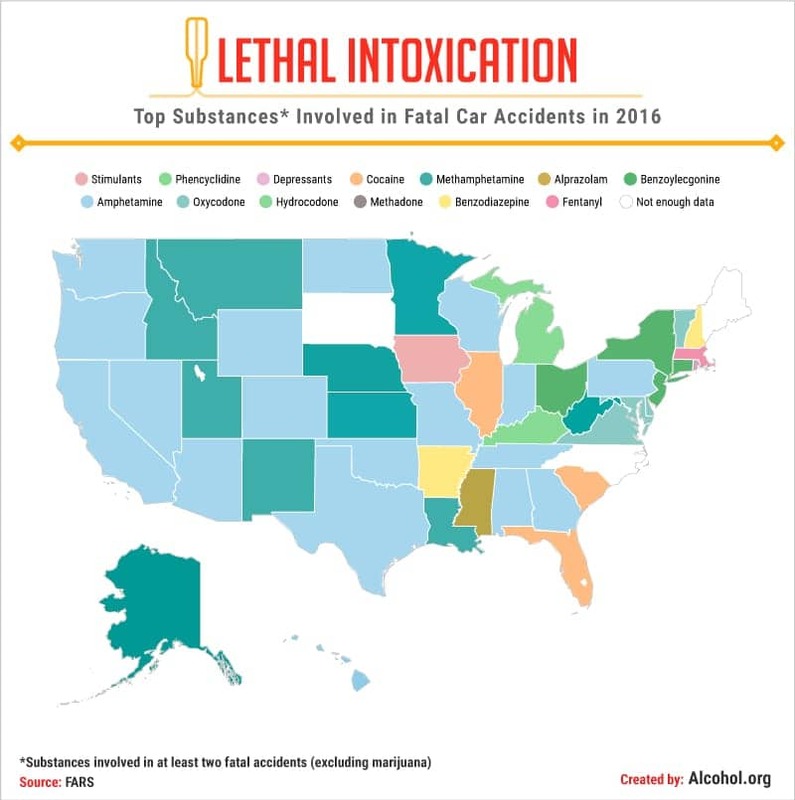 Although every state witnessed drugged driving to some extent in 2016, the most problematic substances varied by region. Along the West Coast, for example, amphetamines contributed to the greatest number of drug-related fatal accidents. In neighboring states Utah, Idaho, and Montana, however, methamphetamines accounted for the greatest number of deadly crashes involving drugs. Farther east, cocaine was the preferred upper, causing the most fatal accidents in Illinois, South Carolina, and Florida. Benzoylecgonine, the metabolite of cocaine, was deemed involved in the most crashes in several large states as well, including New York and Ohio. Elsewhere, the ravages of the opioid epidemic were evident. Oxycodone was the leading drug for fatal crashes in many of the mid-Atlantic states, such as in Maryland, Delaware, and Virginia. Hydrocodone was the top killer in two other states as well, while fentanyl caused the most crashes in Massachusetts. Experts have recorded this trend with alarm, noting there’s no reliable, rapid test for these drugs if police suspect a driver of being high behind the wheel. One area of our data demonstrated little change over the last decade: the most dangerous times for intoxicated driving. Across all years, rates of fatal crashes caused by alcohol and drugs steadily increased throughout the afternoon into the nighttime hours. In some years, a slight dip occurred between the hours of 10 p.m. and midnight, although accidents always peaked between 2 a.m. and 3 a.m. This window corresponds to when bars close in many states, so these crashes may occur when patrons unwisely choose to get behind the wheel. Saturday and Sunday were the deadliest days for intoxicated driving in each of the past 10 years. Because so many of these crashes occur in the early hours of the morning, many crashes technically recorded on these days may involve drivers who began drinking or using drugs the night before. 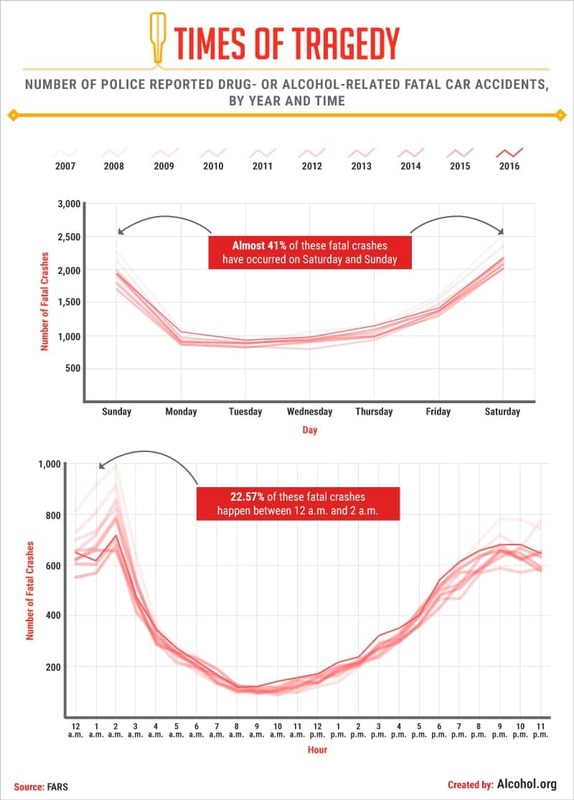 Weekday incidents incrementally increased from a lull on Tuesdays toward their weekend peak. In every year, however, several hundred fatal accidents occurred on each day of the week. That means drivers should remain on the lookout for drunk drivers on weeknights, even if most people aren’t partying. Although the last 10 years have seen instances of encouraging declines in fatal crashes, there have also been troubling spikes as well. On the positive end of the spectrum, 2009 and 2011 each witnessed more than 7 percent declines relative to the year before. Conversely, 2012 saw an 8.1 percent uptick in deadly crashes caused by intoxication – presenting a pattern of fluctuation rather than enduring improvement. The two most recent years of data indicate a period of elevated danger, with a 6.8 percent surge in 2015 followed by a 4.6 percent uptick in 2016. At the state level, year-over-year variation was even more extreme. New Hampshire, for example, saw a 177.3 percent increase in fatal accidents in 2011 – bookended by years of substantial decline no less. In 2016, Vermont and Hawaii had the most concerning single-year spikes. Both states saw their deadly accidents caused by intoxicated drivers increase about 60 percent over 2015 totals. Wyoming, however, claimed the greatest improvement in this most recent year of data, slashing its rate by 41 percent. Over our decade of data, one region seemed most plagued by intoxicated driving deaths: the Northwest. For fatal car crashes resulting from the use of either drugs or alcohol, Montana and Wyoming had some of the highest per capita figures every year, often quadrupling the statistics of many other states. In fact, Wyoming had the greatest single-year total in 2010, with more than 10 fatal drunk or drugged driving accidents per 100,000 residents. To contextualize this figure, consider the fatal accident rate in bastions of relative safety: That same year, New York and Massachusetts each saw less than one deadly crash from intoxicated driving per 100,000 people. When we studied fatal accidents involving drugs and alcohol separately, our chronological view revealed interesting differences. Although fatal crashes involving drunk drivers were more common overall than those involving drug users, some states were particularly prone to the latter kind of crash at times over the last 10 years. In 2015 and 2016, for example, New Hampshire had modest alcohol crash numbers, but particularly high rates of drug-related fatal accidents – perhaps due to the turmoil of the opioid crisis in that state. Delaware exhibited a similar trend in drug-fueled crashes in recent years, despite moderate levels of drunk driving deaths. Narrowing our focus to the latest year of data available, Montana led 2016 in fatal accidents in which drugs or alcohol were involved. Some blame insufficient enforcement, and Mothers Against Drunk Driving ranked the state’s laws dead last in preventing driving under the influence. 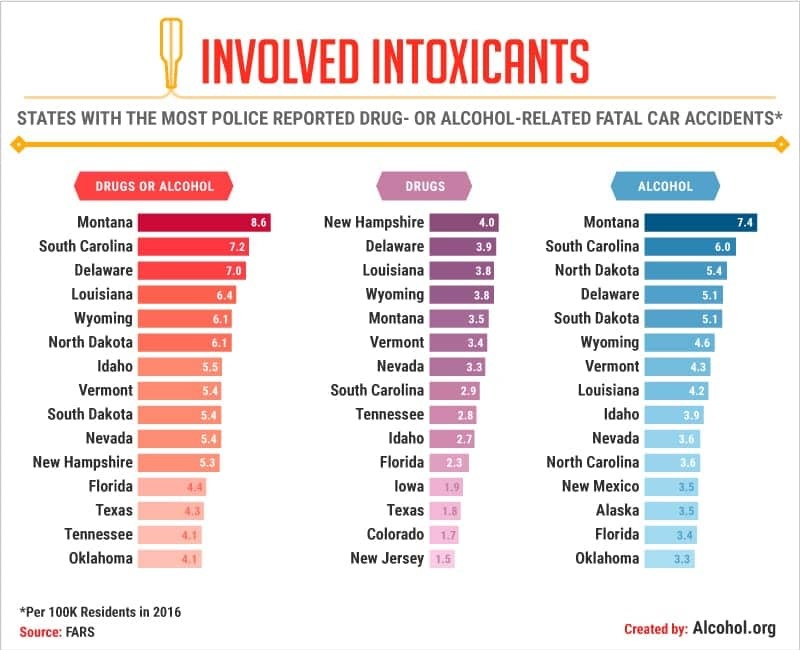 South Carolina was second on this tragic list, and the same spot in alcohol-specific crashes as well. Public safety officials say nearly half of all fatal crashes in the Palmetto State involve an impaired driver, prompting a “Sober or Slammer” prevention campaign aimed at curbing intoxicated driving through tough consequences. Other states owed a large portion of their 2016 fatal accidents to drugs, including New Hampshire and Delaware. Louisiana and Wyoming tied for the third-highest rate of fatal driving crashes related to drugs, with 3.8 accidents per 100,000 residents each. Montana, Nevada, and Vermont also saw more than three fatal drug-related crashes per 100,000 people in 2016. The vast distances between some of these states present a grim reminder: Virtually every region has been touched by the nation’s ongoing drug epidemic. While our analysis reveals substantial improvement in some respects, it also demonstrates persistent and emerging intoxicated driving threats across the country. Every day, American drivers encounter tragedy at the hands of drunk or drugged drivers, as a decade of data make clear. Accordingly, vigilance is still required at all times, both with respect to our own choices and the dangers that other drivers pose when intoxicated. Many who choose to drive under the influence do so because they struggle with substance misuse. Unfortunately, deadly crashes are just one of the dangerous outcomes that can befall those with an addiction. If you or a loved one is ready to seek help, Alcohol.org is here to help you achieve safety and sobriety. When your health is at stake, getting well can’t wait. We collected data from the Fatality Analysis Reporting System, a census of fatal crashes prepared annually by the National Highway Traffic Safety Administration, as of January 2018. These data are available for public use. Our analysis included information from 2007 through 2016, the most recent 10-year span of data available at the time of this project’s completion. This project did not entail statistical testing, so the findings presented above are based on raw totals and averages alone. Accordingly, this content should be interpreted as exploratory, and future studies of this subject should incorporate further statistical analysis.